For the liberta (freed slaves), becoming Augustals meant entering into the dynamics of upward mobility. Their ‘board’, dedicated to worshiping the emperor Augustus, held its meetings in the area of the Forum, where all political, religious and commercial life took place. This is a building with a quadrangular layout, with walls separated by blind arches and four central columns: the floor is in signinum opus; that of the upper floor was in opus spicatum (bricks arranged in a herringbone pattern). 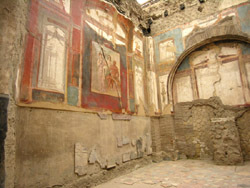 Later, a cell was built aligned with the entrance, which partly retains its original floor and wainscoting covered with marble, and ‘fourth style’ frescoes: on the left wall is depicted the entrance of Hercules in the Olympus, accompained by Jupiter, in the form of a rainbow, Juno and Minerva; the one on the right alludes instead to the battle between Hercules and the Etruscan god Acheloo. In the back, to the right of the sacellum, is the caretaker's room in opus craticium, whose skeleton was found lying on the bed. An inscription now placed on the wall reminds us that the building, dedicated to Augustus (27 B.C.-14 A.D.) while still living, was built by the brothers A. Lucius Proculus and A. Lucius Iulianus, who offered a luncheon to the members of the municipal senate and the Augustals on its inauguration day.